Learn detailed Egg Curry | Dhaba Style Anda Curry with easy and simple step by step video tutorial. 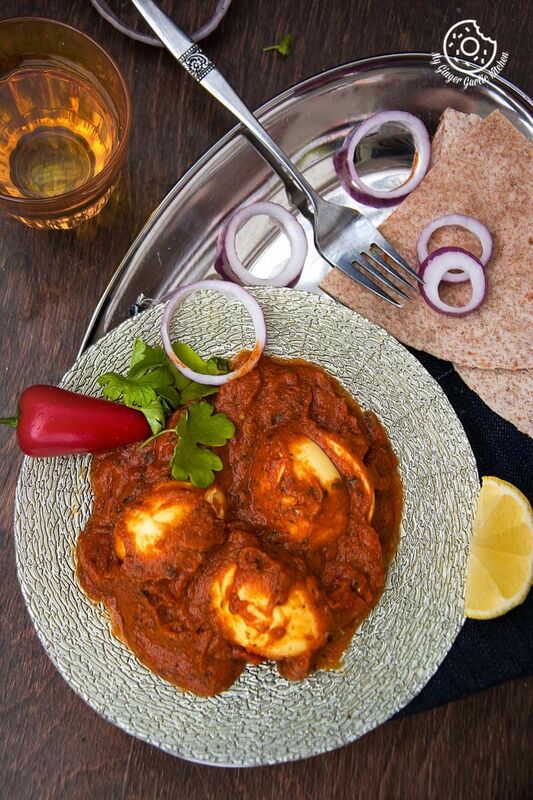 Egg curry is the most alluring way of presenting multitalented eggs. 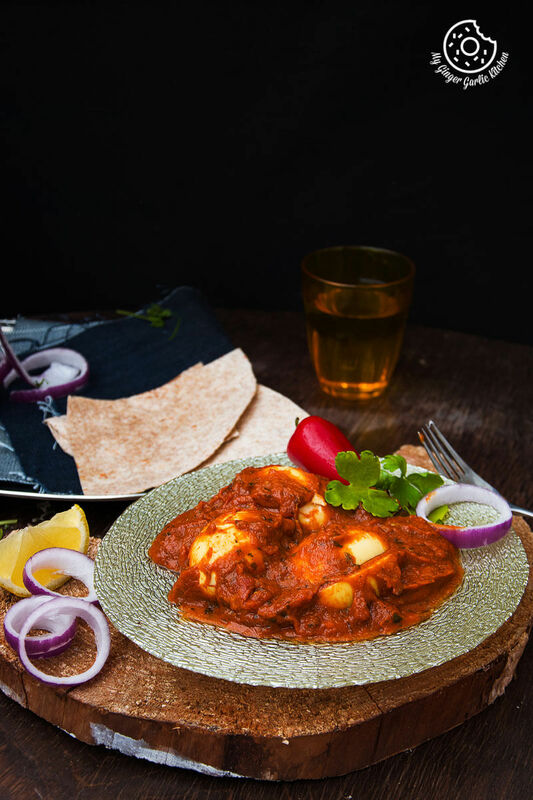 In this North Indian style egg curry, eggs are first boiled, then peeled, and then simmered in the onion tomato-based deliciously spiced sauce which is mildly hot. 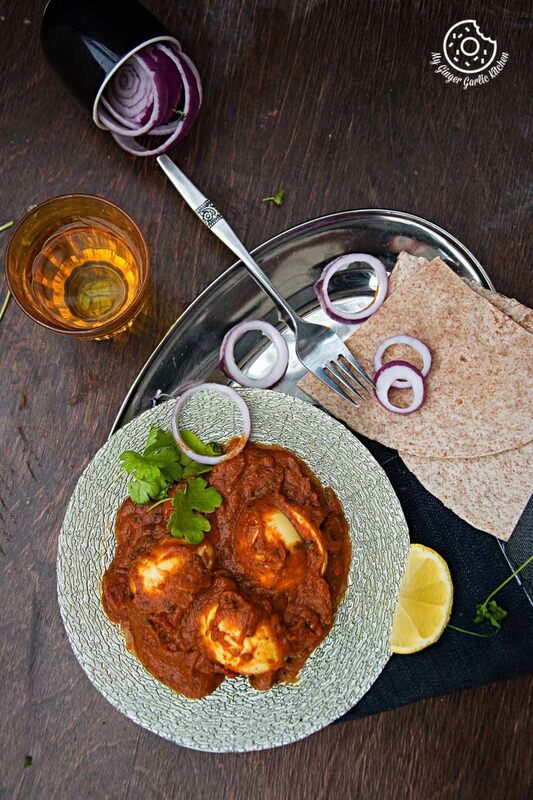 This flavourful, delicious and quick egg curry is perfect to accompany with rice, chapati or paratha. And it can be ready only under 25 minutes. Yay! Today is the first official day of autumn. Happy Fall my dear friends. Are you guys thrilled for the colors? 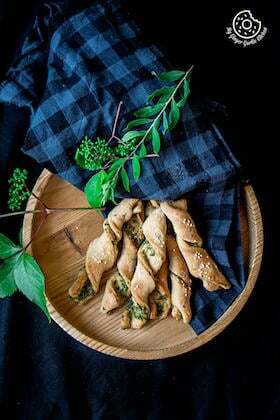 As warm food season is here again, so there should be some comfy food too. And for me, it can’t get any better than a curry. So are we on for a curry at this beginning of the autumn? I told about the beauty of autumn and my love for the autumn colors **here and here. I am just loving the fact that the days are getting colder but still sunny and bright. This makes me love this season even more. I mean cold winds, beautiful colors, and sunny weather. Isn’t it dreamy? Who wouldn’t love this sight? But for those who are still struggling with the hot weather, I wish you get some cooler winds soon. Well, it’s not that I need an excuse to make a curry. But this one is my family’s favorite. 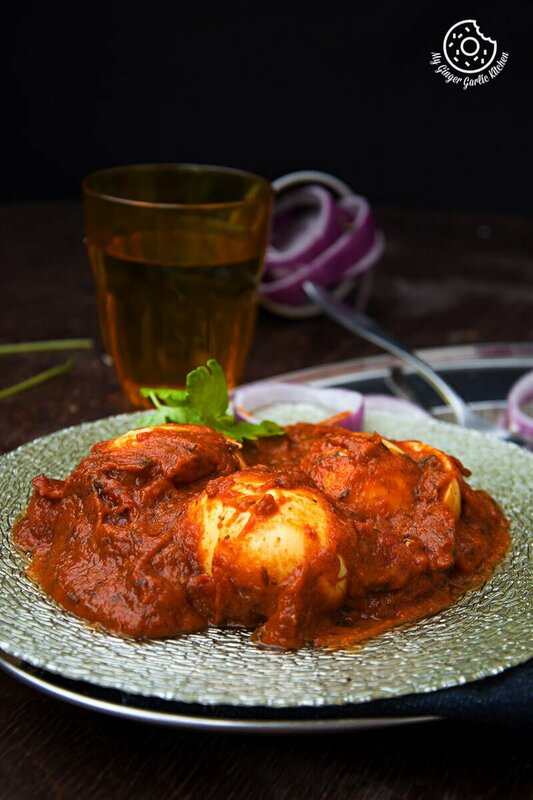 Abhishek and Adoria go gaga over this egg curry. I always keep hard boiled eggs in my fridge, so it is also convenient to cook. Abhishek: “Could you make some egg curry, coz I am really craving for it”. And I know that conversation can happen any day, so I always keep some hard boiled eggs in my fridge. There is also a chili-free version for Adoria as she doesn’t like chili. I know it’s strange. Seems like she is more of a Finn than we are. One interesting thing — one of my Finnish friends’ daughter who’s the same age as Adoria, loves spicy hot food. Whenever she comes to my place she eats everything spicy made for elders, but Adoria doesn’t. I just hope Adoria would also start eating spicy food and I wouldn’t have to make a chili-free version for her every time I make hot food! Egg curry aka ‘Anda curry (in Hindi)’ is a very common dish in most parts of India. 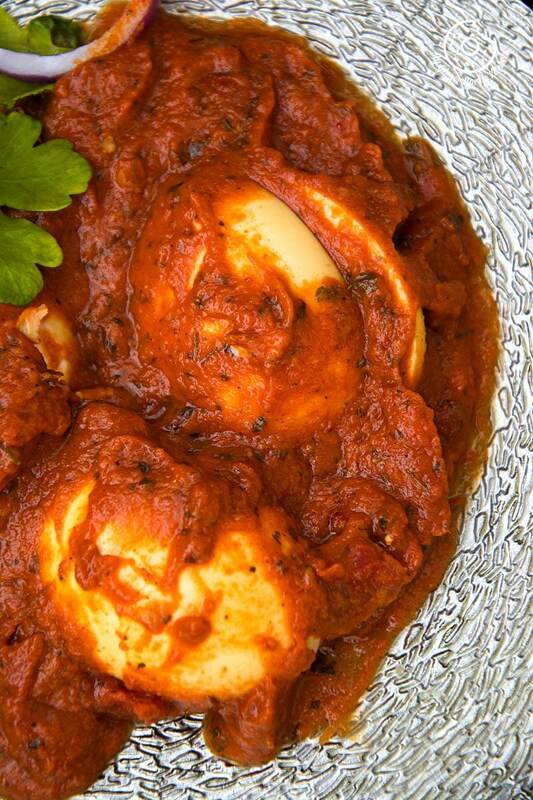 There are many ways of making this Egg Curry. The version I am sharing today is a North Indian version. In this version, hard-boiled eggs are dunked in the gluten-free tomato sauce, which just raises this autumn curry to its perfection! This curry is warm, cozy and healthy, which I guess is one of the greatest combos ever. I bet your egg loving family will go crazy for this curry. It’s just so good! 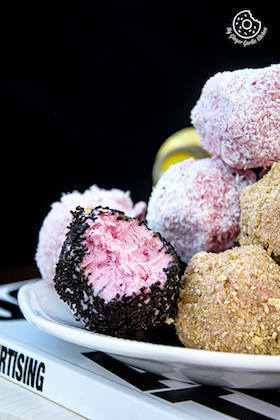 This is also called a friendly dish for bachelor’s because this is mouth-wateringly good and very easy to make. 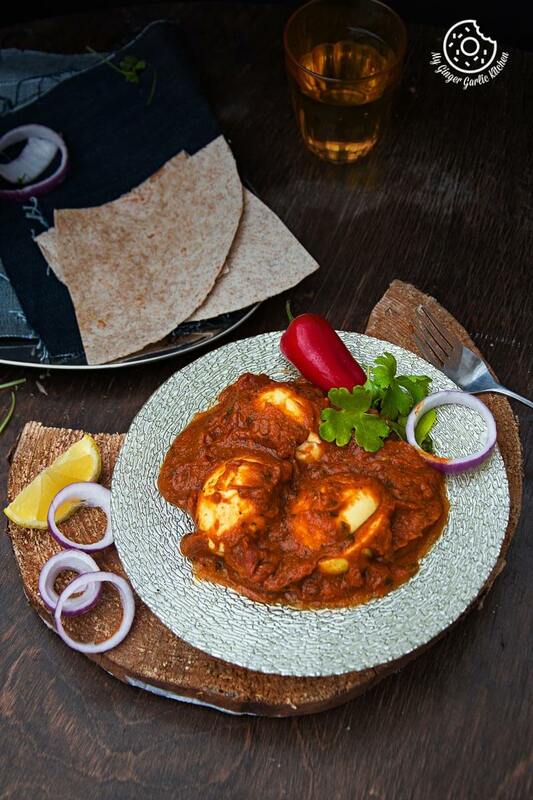 Who would say no to this Egg Curry? 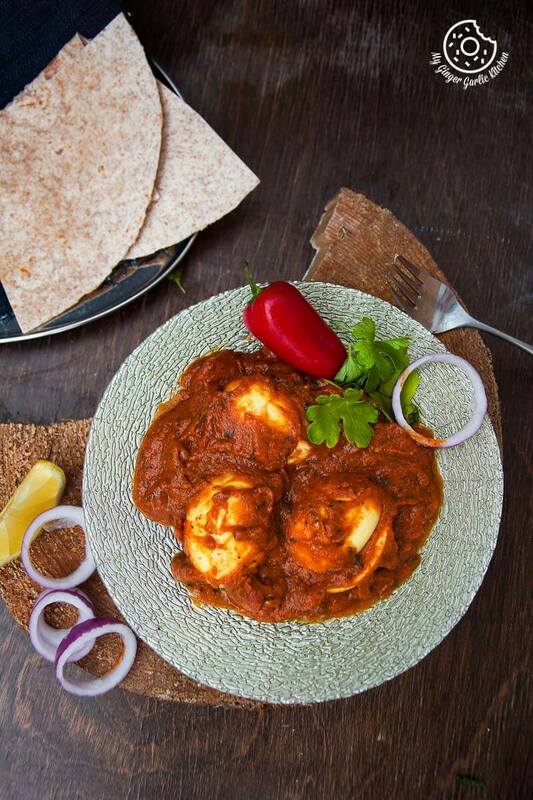 As I mentioned earlier, this egg curry is a north Indian version of this flavorful dish. Tell me, who wouldn’t like to combine two of their favorite things, eggs, and curry? Try this curry, if some guests are coming home — this would make a quick and exceptional dinner side dish. The good thing about this sauce is that it can be made a day before. And when you have guests, then simply add boiled eggs and cook for a while. Tada, you are good to go. 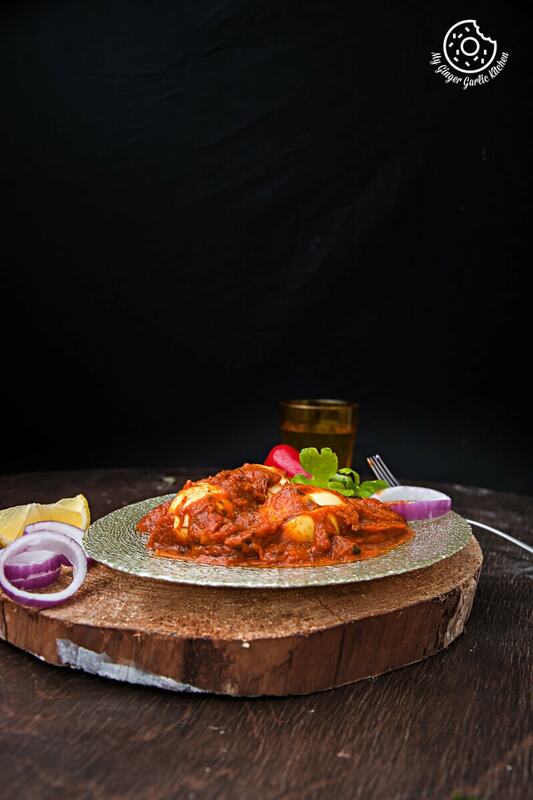 This rich sauce is made using onions, ginger, garlic, chilies, tomatoes, and an infusion of aromatic Indian spices. Like I always say you can adjust spices according to your taste. 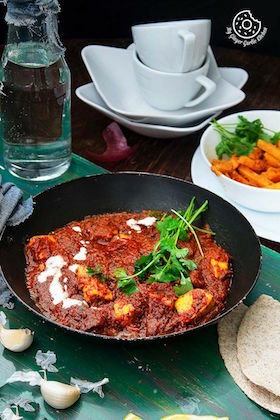 This delicious curry is best served with naan, tandoori roti, rice or any other flatbread. But you can also serve this with quinoa or couscous if you wish. 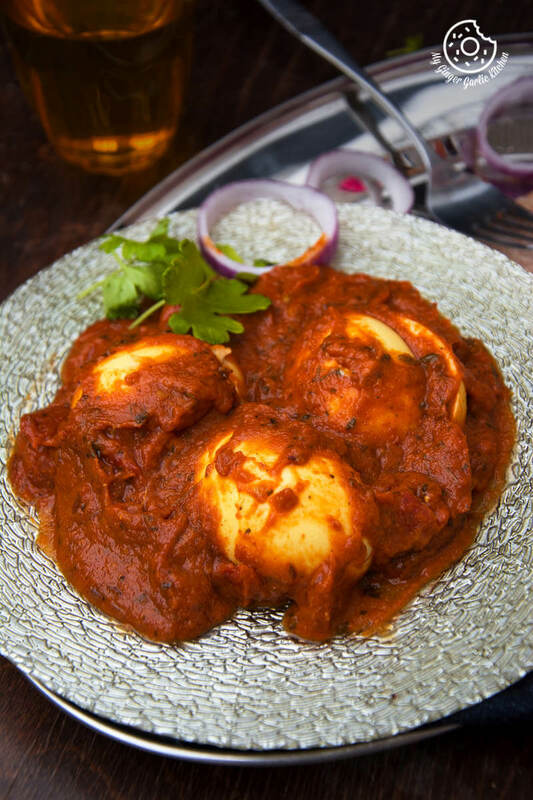 Egg Curry aka Anda Curry is the most alluring way of presenting eggs. Eggs are first boiled, then peeled. And then simmered in the onion tomato-based deliciously spiced sauce which is mildly hot. And plus, this is ready under 30 minutes. 2. Add cumin seeds to it. 3. When they start to splutter add chopped onions and chopped green chilies. 5. Add salt, chili powder, coriander powder, and garam masala powder. 6. Mix well and cook for 1 minute. 7. Add tomato puree, mix well and cook for a minute. 8. Add water and cook covered for 5-7 mins. Stir occasionally. 9. Add boiled eggs and coriander leaves. Cook for 2-3 mins. 10. Add cream and cook for 2 minutes. 11. 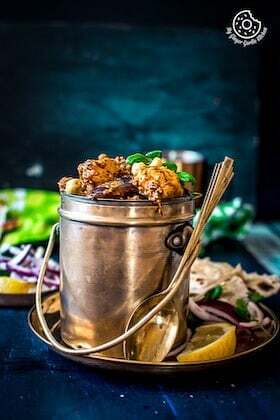 Remove from heat and serve hot with naan or rice.